ED48 – 48″x17″x7″ – A single step that is ideal for shorter spas or spas sunk into a deck. ED33 – 33″x17″x7″ also available. 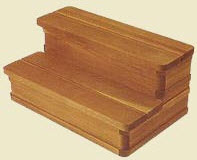 SL48 – 48″x22″x14″ – Our most popular style of step. The SL step is available in any length from 24″ to 80″. Steps less than 40″ long have two step supports. Steps over 72″ have four step supports. SE36 – 36″x22″x14″ – An economical but well built step. It is easy to assemble, lightweight but strong. 36″x22″x16″ – Store your chemicals right where you will use them. The top tread is hinged to open. The bottom tread slides out for easy access. This step is water resistant. SL3T36 – 36″x33″x21″ – The same style as our most popular two tier step but designed for today’s taller spas. SL3T48 – 48″x33″x21″ also available. SE3T – 36″x33’x21″ – Our economy three tier step that is inexpensive but well built. SL63E – 63″x22″x14″ – For an elegant look, choose our enclosed step. Available from 30″ to 80″ See our Style 1 picture on Surrounds page. EDR – 34″x17″x7″ – Made for spas with curved or round cabinets. The back of the step is cut to match the cabinet. The front edge is straight. Let us know the radius of your spa for a perfect fit. EDCL 48″x17″x7″ for spas with a slight curve. SER – 34″x22″x14″ – Designed for spas with curved or round cabinets. The top tread is curved at the back but straight at the front. This is a very economical and attractive double step. Are you in need of a place to sit next to your spa? This combination bench / planter gives you a place to sit, and two “planters” into which you can put potted plants or even store your spa supplies. By adding a third planter and a second bench you can make it into a corner bench that wraps around your spa, or tucks into a corner. The planters are 17″ square, while the bench section is 50″ long. 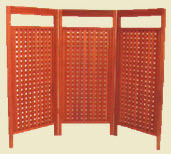 This 81″ long and 64″ high, triple panel hinged privacy screen is made of the finest quality kiln dried redwood. Among it’s many uses, it’s perfect for blocking your neighbors view of your spa. When you get out of your spa do you step upon cold hard concrete? These individual 2′ square redwood panels can be laid out in any shape or pattern to provide beauty and comfort while walking to and from your spa. At 26″ x 16″ this folding table with it’s built in towel bar is perfect for holding drinks, books and other spa amenities. Easily folds down out of the way when not in use.